Status: Restoration completed. Delivered to owner. In the first few decades after their founding in 1853 in New York, Steinway and Sons became known as the highest quality and most innovative of all the American piano manufacturers. Among other innovations, Steinway developed and perfected the upright piano design that eventually replaced the dominant square piano designs of the mid 1800s. 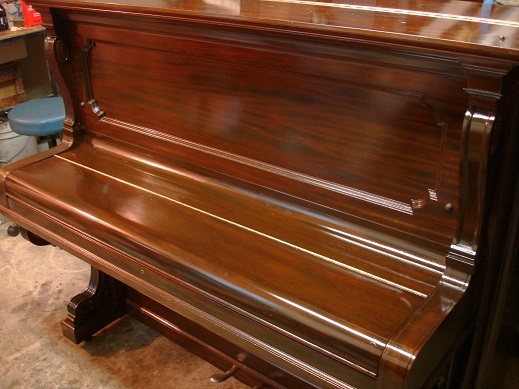 By the year 1900, all of the main innovations of upright design had been developed, and are represented in this lovely mahogany model K 52" upright #96643. This piano came to Historic Pianos in serviceable but unrestored condition, with some case damage and chipped ivories, as well as some damage to the bass bridge. But the owner wanted the restoration to be conservative, preserving as many original materials as possible. The pinblock was tight on its original tuning pins, and the original stringing was intact and remarkably clean and uncorroded. From long use, the hammers were excessively worn and needed to be replaced, as well as damper felts, keybed felts, etc. The original shellac finish was hazy and slightly crazed, and there were damaged sections of veneer and carvings, but the overall finish had a beautiful patina of 111 years. So the decision was made to repair the existing finish where possible, with deep cleaning and judicious application of new shellac where needed.